See… Tora! Tora! Tora! is a 1970 American-Japanese film that dramatizes the Japanese attack on Pearl Harbor. The title is made up of the code-words that were used by the Japanese to indicate that complete surprise was achieved (tora is Japanese for “tiger” but in this case, “to” is the initial syllable of the Japanese word totsugeki, meaning “charge” or “attack”, and “ra” is the initial syllable of raigeki, meaning “thunder bolt”). And… Tory! Tory! Tory! 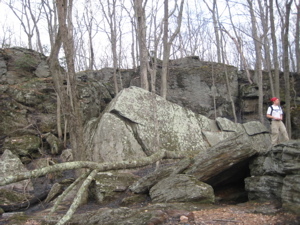 is a 2008 CTMQ post that recaptures Steve and Rob’s attack on a historically famous natural rock formation in Burlington, Connecticut. The title is a pun on the code words that were used by the Japanese to indicate that complete surprise was achieved (see above). As with the attack on Pearl Harbor that the title here invokes, there was also fire and death and destruction in Burlington that day. Also, Rob and Steve were in complete surprise when they hiked into the woods only to find them all burned up. Yes, Rob and I were hiking our second section of the Tunxis Mainline Trail when we encountered an honest-to-goodness brush/forest fire! Our first brush with it was right near Tory Den (alternately called “Tories” and “Tory’s” Den), where all the land north and east of the Den were blackened and burnt. 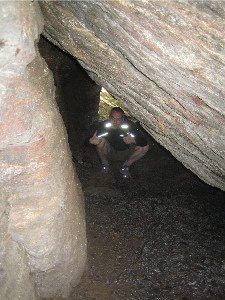 The Tory Den was formed when a large slab of rock fell from a perpendicular position onto other rocks and became supported in such a way as to allow considerable space beneath. One entrance, facing southeast, is ten feet wide and five feet high. The interior is the same width as the entrance and approximately six feet high, with a roof opening in the center large enough to allow one to pass up through. It could have been used as a chimney. The northern entrance is four feet high and five feet wide. Length over all is about 30 to 35 feet with a slight turn at about the center of the cave. It is very suitable for cave-keeping should anyone like to revert to primitive life…. 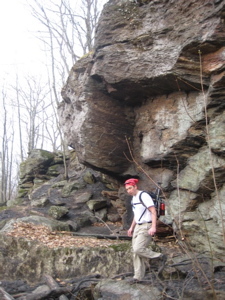 In the Burlington ledges, at the southwest part of the town, is a cave known as the Tory den. 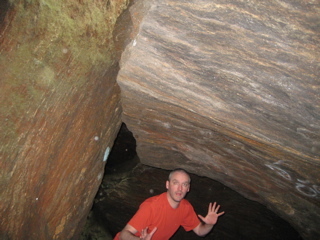 Stephen Graves and his bride of about nineteen lived in a log cabin in the southeast part of Harwinton, within a mile of this cave. He was drafted, hired a substitute, and while his substitute was still in the service at Grave’s expense, he was again drafted. This he considered unjust and freely expressed his opinion, thereby incurring the enmity of Captain Wilson and his company of the Sons of Liberty. 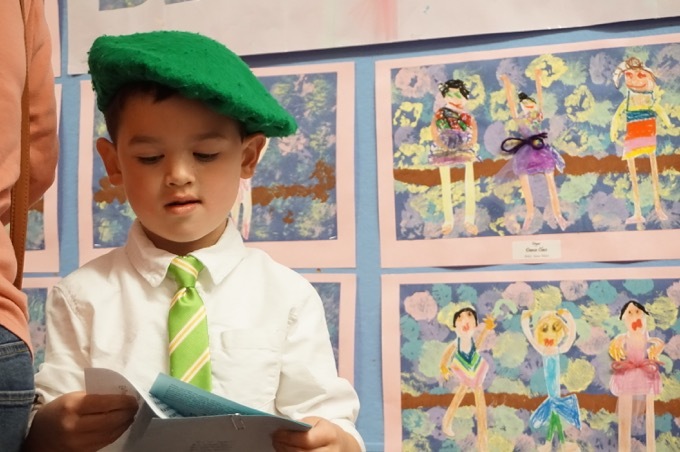 Soon after this he went to visit his mother at Saybrook. He was pursued and arrested as a deserter. He came so peacefully that they relaxed their vigilance somewhat and he made his escape. On reaching home, he hid himself without making his presence known until after his pursuers had been there and his good wife had assured them that Mr. Graves was in Saybrook on a visit. 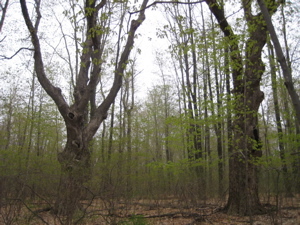 At one time Graves was tied to a tree and severely whipped. Me (Stephen), whipping myself. I go deep into character for CTMQ. At another time it is said that Graves was hung to a chestnut tree near his house but let down again before he was severely injured. Many of his neighbors were Tories. For sometime he and several companions were compelled to live at the Tory den, and each night the young Mrs. Graves went through the dark and pathless woods, over rocky ledges, to carry them food. The den was often resorted to for shorter periods of refuge. When at work on their farms a band of Tories worked first one farm and then another, so that they might protect themselves. If working alone, or when an overpowering party of Sons of Liberty approached them, they would flee to the Tory den. Their faithful wives were always on the watch, and would blow a horn or a conch shell as a warning at the sight of any of Captain Wilson’s men, or other Tory hunters. These horns were a source of great annoyance to Captain Wilson, and he once presented his pistol to the head of a young girl that lived with Mrs. Graves and threatened to shoot her if she did not tell him where the noisy conch shell was concealed. Were a stranger to ask me the way to the Tory Den I should tell him to seek out someone who had been there before and go with him. He could not find it alone. One hundred and thirty years ago, the patroits tried to find it and although they scoured the woods in bands, they failed utterly. So would you today, for the cave is a favored spot, open only to its friends. Those who were its friends then, always found it welcoming them, and so, I trust, may you learn to find it. 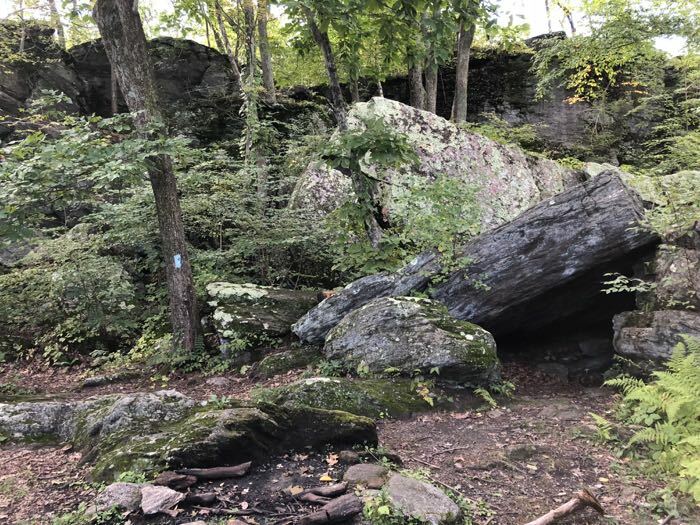 It lies in the Ledges, and is backed by a tall cliff, facing southeast toward Chippeny Hill, which an agile climber can scale in less than a minute. Ferns, and briers, and sweet smelling things that you will fail to recall the names of, grow over the entrance. Within, the impression is that of considerable length. Two lines of seven men could sit facing each other beneath the roofs of rock; three could stand upright where the rocks are highest. The quickest way for them to escape would be for the two southernmost men to turn to the south and, stooping, walk out; and for the one northernmost man to turn to the north and crawl out. The floor of the cave is dirt which washed down from the neighboring cliff. Those who came to this haven of refuge and what they did beneath the rocks and ferns will never be known to history. There is no record nor sign. It is a tradition that Ruth Graves’ oldest child was born there, but while it is possible that the father, Stephen Graves, was hiding there at the time of the child’s birth, it is improbable that the cave was ever the refuge of women. As foot tracks would show in the snow, it is doubtful if it was occupied in the winter, and it is also doubtful if a fire was built there even in the day time, as the smoke might be seen by the Sons of Liberty. When the cave was in use, both entrances were so carefully hidden that it was never discovered, in spite of most careful search of the ledge above. The late Mr. John J. Welton thought there must have been an entrance partly underground, but nothing of the kind is now known. 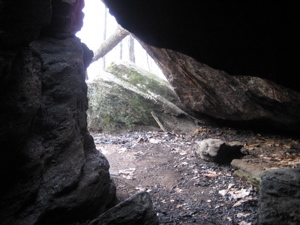 The den was rediscovered on Thanksgiving day in the year 1838 by X. A. Welton, a grandson of Stephen Graves, and Bela A. Welton, boys of fourteen, who after hunting all day accidentally came upon the south and larger entrance. Come! oh, rocks of the Ledges, and tell me who of the Tory clan came oftenest to the den. First of all there was Stephen Graves of Harwinton; and many a time did he run from his log cabin to hide himself beneath its moss grown roof. And many a time, doubtless, did the secret meeting of men that he was harboring adjourn thither post haste. His home was nearer to it than were any of the Chippeny Hill farmhouses, and therefore it is possible that it was he who discovered it in the first place. It was Ruth Graves, his young wife, who fed the men in the den. She carried the food from the house and left it for them on a flat rock near the edge of the woods, for she dared not risk betrayal by going nearer. I wonder if there was anyone in the cave the night Joel Tuttle crawled into the entrance. The day before he hung by the neck from an oak tree on the Federal Hill Green at New Cambridge. 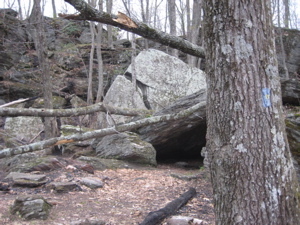 Captain Thomas Hungerford, a patriot neighbor whose name later appears as a fellow churchman, cut him down, and he lay at the foot of the tree insensible until sometime in the night, when he so far revived as to be able to make his way to the cave in the Ledges, about four miles distant. Excellent – The Leatherman also frequented the Den supposedly. I think the only story left untold is that of Moses Dunbar – he was the brother-in-law of Stephen Graves and also was a Loyalist. He is interesting to us because he is the only Connecticut citizen tried and convicted as a traitor – and hanged. But at least he got to check out Tory Den beforehand! Ha – I thought this was going to be about Tori Spelling and Dean McDermott. Silly me. What does the carving on the rock to the left of the cave entrance say? Been trying to decipher it for years.